Before he is known as the Babe, George Herman Ruth is just a boy who lives in Baltimore and gets into a lot of trouble. But when he turns seven, his father brings him to the gates of Saint Mary's Industrial School for Boys, and his life is changed forever. At Saint Mary's, he's expected to study hard and follow a lot of rules. But there is one good thing about Saint Mary's: almost every day, George gets to play baseball. Here, under the watchful eye of Brother Matthias, George evolves as a player and as a man, and when he sets off into the wild world of big-league baseball, the school, the boys, and Brother Matthias are never far from his heart. With vivid illustrations and clear affection for his subject, Matt Tavares sheds light on an icon who learned early that life is what you make of it --and sends home a message about honoring the place from which you came. "There is warmth and affection in Tavares's paintings, which generously illustrate the text, often in immersive spreads." 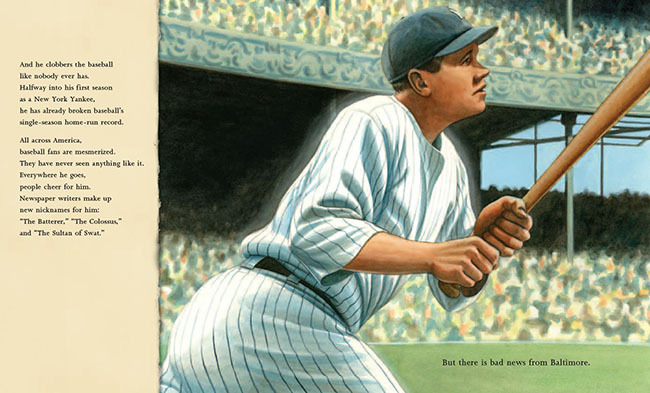 "On the cover portrait of this picture-book biography, George Herman Ruth's eyes twinkle so realistically, one expects the famous wink. Inside, this exceptionally engaging chronicle recounts Ruth's amazing rags-to-riches story.... Well-researched, realistic illustrations, rendered in watercolor, gouache, and pencil, depict early-twentieth-century life and Major League Baseball during Ruth's era. Equally important, the art captures Ruth's irrepressible personality and joy in playing baseball. Yes, the eyes definitely twinkle." 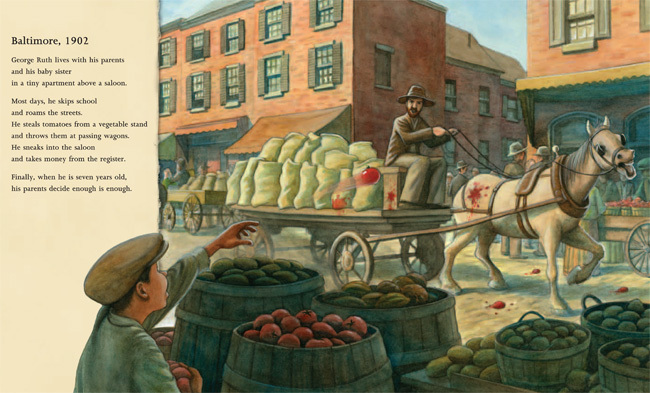 "The appeal of Matt Tavares' beautifully illustrated biography is its focus on Ruth's humble origins." "Is there a bigger baseball fan in the children's literature world than Matt Tavares?... Tavares expertly conveys Ruth's charm through his mixed-media illustrations- the boyish grin, the huge appetite (one humorous spread features Ruth in front of an outlandish spread at a restaurant), the love of the game he played so well. Tavares brings the well-paced story to a nice close as the now-world-famous Babe returns to Saint Mary's to put on an impromptu slugging exhibition for the boys, similar to the ones Brother Matthias gave that so enchanted George as a boy. It's a lovely, poignant ending to a standout sports picture book biography." "Tavares continues to prove he's a double threat, with a concise, forthright writing style and expansive, sepia-toned watercolors that bring to mind vintage photos and newsreels." BECOMING BABE RUTH. Text and Illustrations copyright Â©2013 Matt Tavares. Reproduced by permission of the publisher, Candlewick Press, Inc., Somerville, MA.